An international team of researchers working at Mount Carmel, Israel has found evidence of the use of flowers by ancient people in burial rites. In their paper published in the journal Proceedings of the National Academy of Sciences, the team describes impressions made by flowers they discovered in mud layers beneath bodies laid to rest after death by people of the Natufian culture. The display and use of flowers as part of burial rituals is common throughout the modern world, but scientists have found it difficult to learn more about the roots of such practices due to the temporal nature of plants. In this new effort, the research team working at the Raqefet Cave—part of a larger archeological site—found flower impressions preserved in a layer of dried mud beneath the bodies of 29 skeletons. Closer examination of the impressions showed them to be from mint, figwort, and sage plants. Additional testing of the soil in which they were found showed elevated levels of phytoliths—crystals made by such plants. Because the cave floor was chiseled to make the grave sites flat, the researchers concluded that the mud layer on top of each of them was placed intentionally. Flowers were then laid down to create a bed upon which the deceased person was laid. Pressure from the weight of the body on the flowers caused some of them to be pushed into the mud causing impressions. Carbon dating indicates the flowers and skeletons were put in place between 13,700 and 11,700 years ago—marking the earliest known use of flowers as part of burial rituals. The Natufian culture was made up of people living during pre-agricultural times. They lived in the eastern part of the Mediterranean in an area historians call the Levant, and are believed to be some of the first humans to have lived as a communal society. They built homes and shared structures, filled them with custom made furniture and tamed wolves to serve as companions. They are also believed to have been one of the early groups of people at the end of the Pleistocene that started the long journey that eventually led to agricultural. Flowering plants possess mechanisms that stimulate positive emotional and social responses in humans. It is difficult to establish when people started to use flowers in public and ceremonial events because of the scarcity of relevant evidence in the archaeological record. We report on uniquely preserved 13,700–11,700-y-old grave linings made of flowers, suggesting that such use began much earlier than previously thought. 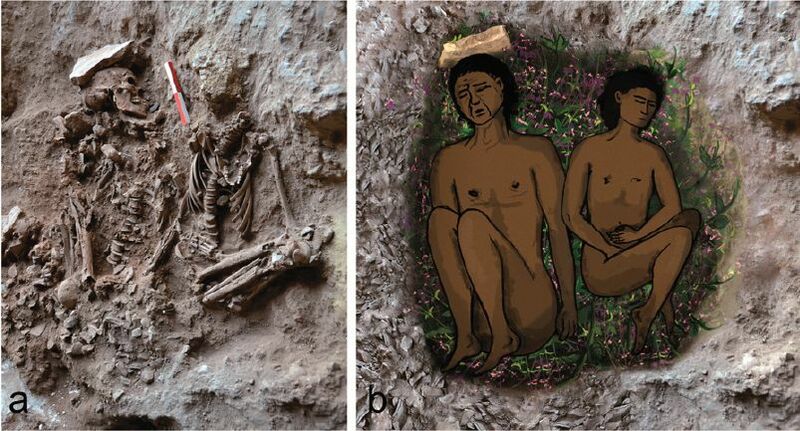 The only potentially older instance is the questionable use of flowers in the Shanidar IV Neanderthal grave. The earliest cemeteries (ca. 15,000–11,500 y ago) in the Levant are known from Natufian sites in northern Israel, where dozens of burials reflect a wide range of inhumation practices. The newly discovered flower linings were found in four Natufian graves at the burial site of Raqefet Cave, Mt. Carmel, Israel. 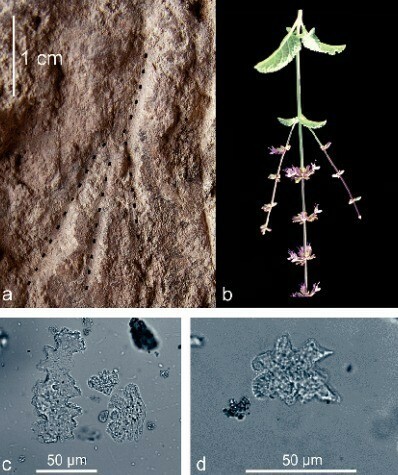 Large identified plant impressions in the graves include stems of sage and other Lamiaceae (Labiatae; mint family) or Scrophulariaceae (figwort family) species; accompanied by a plethora of phytoliths, they provide the earliest direct evidence now known for such preparation and decoration of graves. Some of the plant species attest to spring burials with a strong emphasis on colorful and aromatic flowers. Cave floor chiseling to accommodate the desired grave location and depth is also evident at the site. Thus, grave preparation was a sophisticated planned process, embedded with social and spiritual meanings reflecting a complex preagricultural society undergoing profound changes at the end of the Pleistocene.